Webb Communications recently developed two package-tracking websites for Direct Link, a Sweden Post Group company. 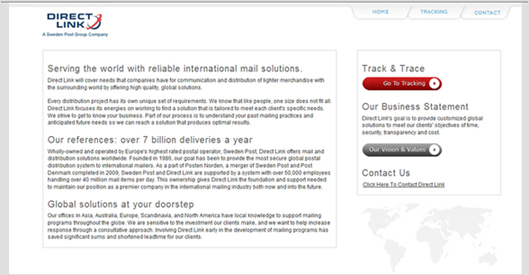 Direct Link provides international mail services to major corporations and non-profit institutions worldwide. Wholly-owned and operated by one of Europe's highest rated postal companies, Sweden Post, Direct Link offers global mail and distribution solutions. As a part of Posten Norden, a merger of Sweden Post and Post Denmark completed in 2009, Sweden Post and Direct Link are supported by a system with over 50,000 employees handling over 40 million mail items per day. Webb Communications developed two applications for Direct Link’s U.S. operations: A Track & Trace application, which allows businesses and individuals to track the status of their international mail shipments from a web-based interface. 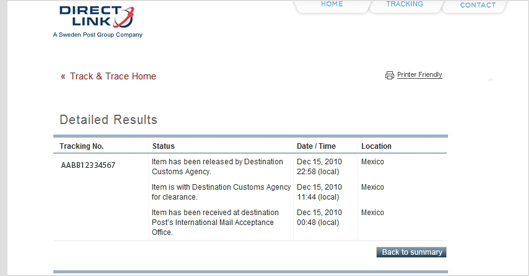 The system tracks the status of parcels sent to more than 240 countries worldwide. Webb also upgraded Direct Link’s “Global Hot Spots” system which helps alert shippers about potential “disruptions” in international mail services caused by postal strikes or other events. The site is a valuable resource for international mail shippers in North American and beyond.